Third outpost of the fusion staple, in a Southwark ex-factory. 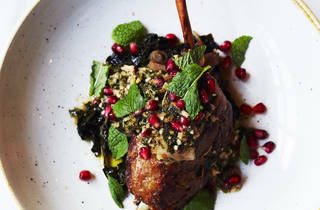 As you’d expect, the food at this third branch of coffee-roasters-turned-fusion-fare hawkers Caravan is sound – with a broad, globally peripatetic menu branching ever wider from the Antipodean fare it first made its name with in Exmouth Market all those years ago. 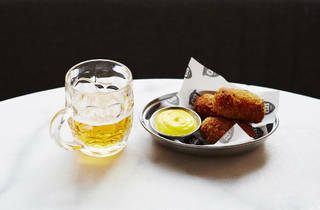 Snacks of cornbread and peanut wontons – practically humming with the earthy funk of blue cheese – are reliable staples harking back to those early menus, and Caravan succeeds best when merging East and West. This is exemplified in chive and pork potstickers – Chinese ‘gyoza’, if you like – served with a slick of black vinegar mayo. Also in a simple kale, pecorino and truffled umeboshi salad that was nevertheless an open-hand slap of flavour, liberal with the cheese and lousy with the salt-sweet of pickled plum. 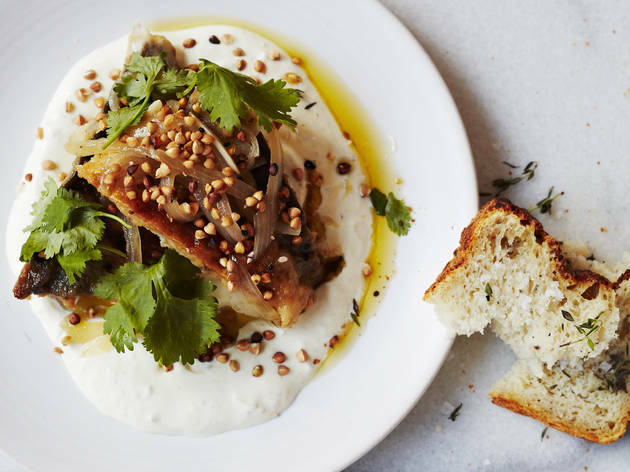 Then there was an excellent, densely meaty plate of yuzu-pickled mackerel – more akin to Scandinavian herring than the expected ceviche – and set off by the genius addition of brittle toasted buckwheat. 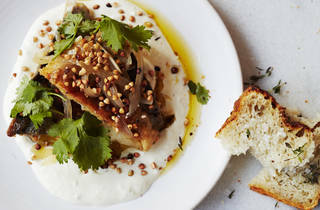 Duller notes come in the form of confit fennel with lemon gremolata – bereft of aniseedy freshness, as cooked fennel often is – and an anchovy, preserved lemon and jalapeño pizza that, while passable, sorely lacked a knockout flavour on account of the fish being marinated rather than salted. As for the cavernous room – all lofty height, stripped wood and metal girders – it looks marvellous, though the the swathes of hard surfaces come at a cost. My God, are the acoustics terrible here. It almost makes you long for carpets. But those are the only downsides. If Caravan keeps rolling out offshoots like this, then we should be grateful. Mon-Fri 8am-10.30pm; Sat 10am-10.30pm; Sun 10am-4pm. Very trendy cafe indeed. 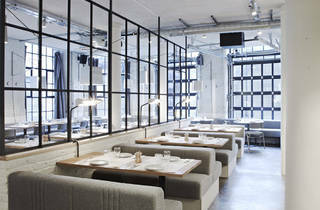 The interior is very fitting for the bankside area (read shick warehouse / industrial). The food is always good, though the portions vary from dish to dish. 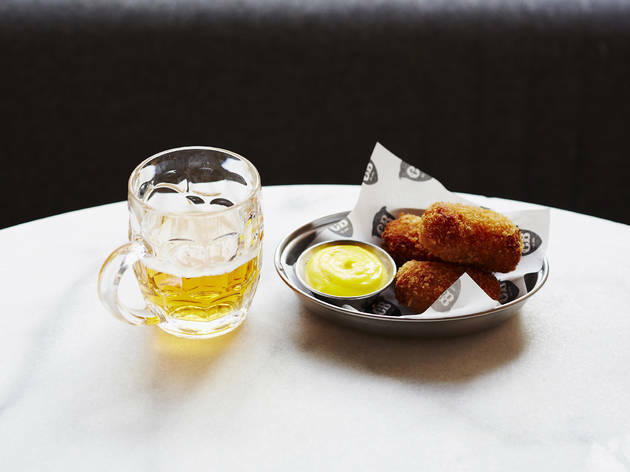 The bankside setting is ideal for post-lunch window shopping. This place is always busy, so booking is essential. I highly recommend their grain pancakes! Having gone for drinks and brunch, I definitely think this is worth many more visits! 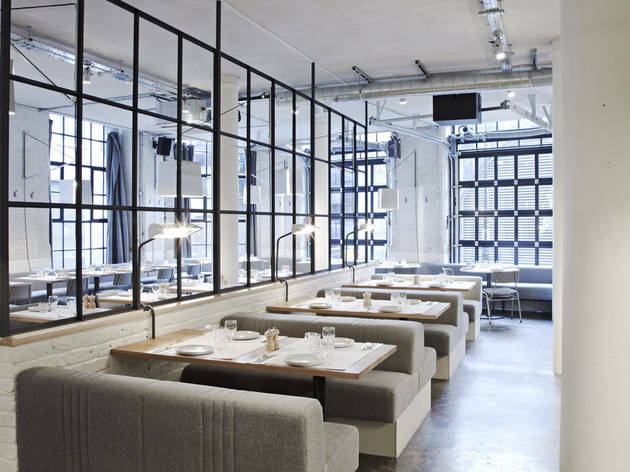 An industrial feel is created with exposed brick walls, steel frame dividers and beautiful marble countertops. The food is beautifully presented and well made. I had the crumpet with cream and poached fruit - delicious! Drinks range from cocktails to healthy, freshly pressed fruit juices The staff, although a little relaxed, are still professional and friendly! I feel like I've just been through a portal to the mainland. This place is so European I love it. To be honest I don't even know what a European restaurant is but this place just conjured up every City break I've ever been on so I know this is it. The atmosphere is informal but it also feels slick and high end, with a few hipster trademarks such as bare lightbulbs and and open view into the pantry. The tables are laid out individually but they encourage sharing to get smaller parties in without a wait. I wouldn't describe it as comfy and I spent the whole night saying pardon to my dinner date because it was so loud. After dinner I am normally happy to sit all night chatting and milking a mint tea but here I felt like the food was the main event and after that I was happy to leave. 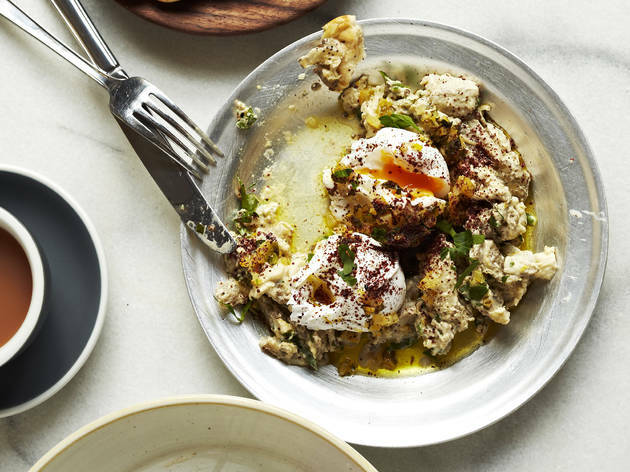 Dishes are mainly small plates to share as is de rigueur these days. From Asian inspired salads to meatballs, Middle Eastern flatbread to Spanish croquetas, and a nice line in pizza, they cover lots of bases. It's a rare thing to go round the world in one restaurant and come out feeling satisfied but this place genuinely pulls it off. The ingredients tasted fresh and my meal actually felt healthy, making a nice change from the influx of burgers and fried chicken London is always tempting me with. They also seem to naturally cater for lots of dietary requirements with the menu. It's not cheap, with each small dish averaging £8 - which I suppose actually could be cheap in a group but when you want to try everything in a party of two you're either gonna spend a lot or plan another visit. I've done both! Caravan Bankside is located in a lovely airy converted warehouse about a 10 minute walk from London Bridge, just far enough out of the way that the crowds of tourists at Borough Market wouldn't know it's there. The decor is simple, focusing on a white, light grey and oak colour palate and there's lots of booth seating. The music isn't too loud to speak over but it's a good mix of classics like Get Up, Stand Up and I Shot the Sheriff. As a vegetarian I'm quite used to having a maximum of two or three choices on a menu, making ordering quick and easy. Not so at Caravan with their brunch menu - there were about a dozen enticing choices which could be made vegetarian - a porridge waffle, coconut bread, shakshuka, jalapeño cornbread with beans and avocado and so many more! Caravan opens at 10:00 on weekends and the minute it opened it quickly began filling up but it's a big enough restaurant that by 11:00 there were still a number of tables available. As soon as we were seated we were promptly brought a jug of tap water and asked if we would like any coffees. I ended up ordering the jalapeño cornbread which was a very generous portion for £9.50 - it came with lots of mashed avocado, two eggs, black beans, pickled red onion and coriander. This is definitely a top brunch place and I'm sure it's great for lunch and dinner too. It definitely fills a void in an area which I felt used to lack good sit down restaurant options. The food is out-of-this-world delicious. The biggest problem is deciding what to eat from the menu. This time we had the cod with wasabi truffle pureee (are you kidding me!? ), the crispy chilli salt tofu, yuzu picketed mackerel and Burmese chicken salad. Blew my mind. If you haven't been already I suggest you drop what you're doing and go right this second. Fantastic food and fantastic atmosphere. I went with my wife for dinner just after it had opened and we thought it was superb. Great atmosphere and service and food was truly great. We both shared a few small plates and a larger plate of lam meatballs. Loads of vegetable dishes to choose from with great use of spice and fresh ingredients. Could not find anything wrong with it. Had some cocktails which were really good as well. staff really friendly and attentive. all in all a great visit and will be returning for sure. would highly recommend. Big tables and banquet seats allowed us to enjoy a night out with the 2 Kids for the first time! ( 5 months and 2! ) easy tasty food and fast service allowed us all to have what we wanted quickly tempura oysters a must, loved the little plate of crushed chilli, fresh oregano on the side of the pizza. Great wine list and check out the shrubs. Pioneers in this field! Will be back soon. A great new place in the developing part of Bankside. A welcome addition. Caravan's other two venues were pioneers, and this one is as good as: the menu, the look and feel - all make sense. The food is amazing, the guys on the floor look happy (although at times a tad bit too relaxed perhaps) - a great place where food comes first. Try any of the vegetarian dishes (mains or small plates), or the pizzas - the nduja one was unbelievable! Wonderful restaurant, great food, attentive service. We enjoyed our meal. Child-friendly restaurant. We had our two year old boy with us. He managed to break one of our glasses. Staff was great, cleaned up fast and replaced the drink. 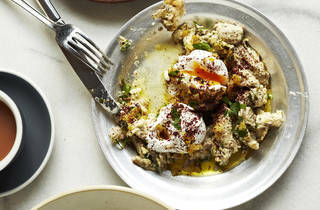 Love Caravan and so excited to see they have opened in Bankside! Already been for brunch in the weekend and for dinner on Tuesday evening - was busy given they've only just opened! Loved the food, the atmosphere and the staff were really switched on and friendly too. Will be back. How often does it happen to you to walk around town hungry and refuse to indulge in a pre-made cold fried chicken sandwich for lunch? Almost every day, right? 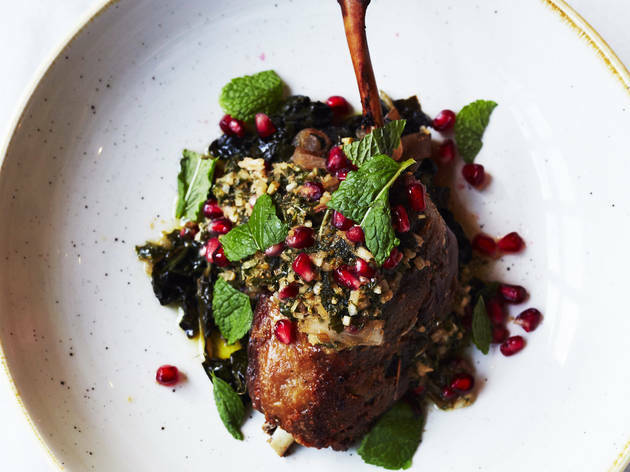 My quest for something more than that led me to Caravan's latest branch opening in Bankside. Although it has been open only for a week it gave me the impression that everything has been well taken care of. I decided to go for a fresh chicken and noodles salad with a glass of Chenin Blanc to match my starter. The main was a sea bass with red curry and coconut sauce so delicious that I had to eat it slowly enough for the waiters to ask me if there was anything wrong with it. Medjool date and cardamon cake with an espresso was the perfect closing to this impromptu Thursday lunch for one. I am taking my other half there soon though.